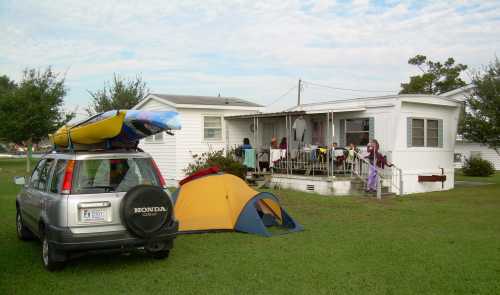 The Adventure Family ventured out to sea kayak on the last weekend in October 2007, contributing in part to the temporary end of the severe drought in NC. There were three sort of new Adventure Family recruits along on this trip; Shark Lady, Mighty Mouse, and Georgia Boy. 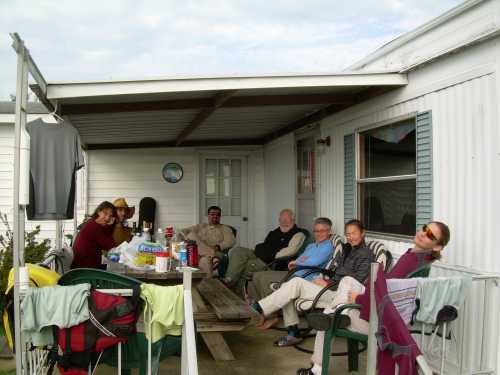 All of them had shared Adventures with some of the group before, but this was the first time they’d been on the Shackleford kayak trip, a long-standing tradition in the Family. We even had three people fly in for this Adventure, coming in from Chicago and Georgia. 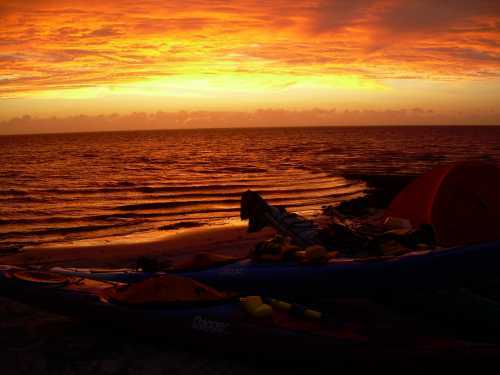 Our plan was to launch from Shell Point on Friday, paddle to Shackleford Banks, spend two nights and come back. The monsoon rains started midweek and were still in full swing when we arrived Friday afternoon. 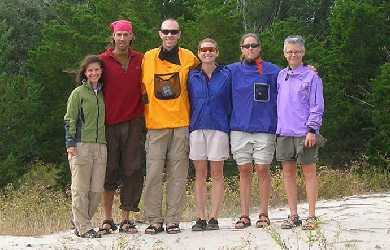 Being hardened Adventurers, we didn’t let that stop us, but we did decide to paddle to Brown’s Island instead of Shack. We reasoned that it was closer and would be easier to get back from if conditions worsened. Setting up camp Friday night was a challenge worthy of including in an adventure race someday. It was a team effort to erect the tarp and tents in howling winds and driving rain. Dinner was only half possible, as the intermittent showers, no, downpours, prevented us from boiling the srimp. 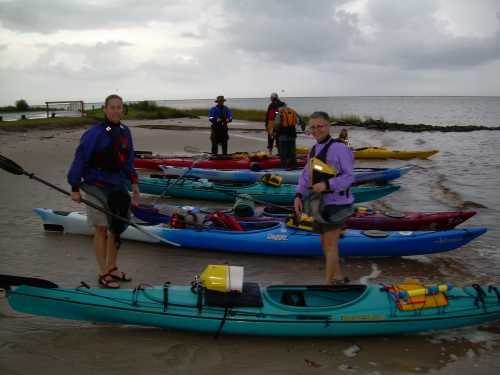 until halfway through breakfast, when the monsoon rains returned and stayed with us as we paddled back to Shell Point. We decided that the forecast of strong north winds on Sunday was too risky – we’ve already spent an extra night on Shack that way. So we went looking for a different place to camp. We found a nice flat grassy spot near Cape Carteret. Fortunately it was Muffin Man’s place, so we didn’t get run off the property. We had a wonderful dinner of long-sought-after red beans and rice with fajita chicken. This dinner required at least three trips to the grocery store, but it was worth it! Afterwards, we enjoyed a nice moonlit stroll around the neighborhood. 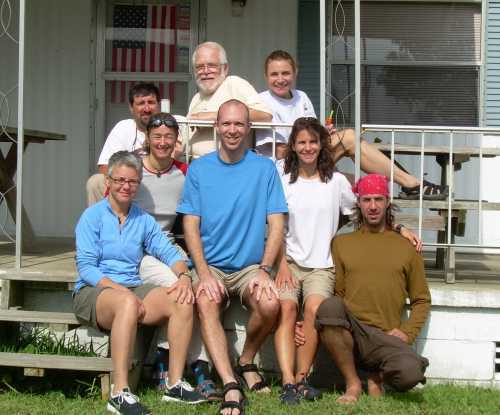 The next morning we enjoyed chocolate chip and pecan pancakes on the front porch. Then we paddled out to an island in the intracoastal waterway. The winds were brisk and strong enough to make us not regret our decision to skip Shack this time. On the drive home, we stopped and introduced three new Adventurers to Bojangles’ cuisine. I think they’ll live. As always, the group found a way to have fun despite the challenges we faced. That is the Adventurer’s way! !